Written by Steven Dietz, Fiction premiered in 2002 at McCarter Theatre Center. The play returns to the Princeton area through the Pegasus Theatre Company. Fiction is poignant, but much of the dialogue is witty — Michael quips that film is a “medium” because “it’s neither rare nor well done.” Certain plot points are predictable, but Dietz is counting on that fact; he keeps the audience in suspense, until the end, about the exact nature of the characters’ pasts. “You’re the master of the coda, you know that? The tidy, definitive conceit,” Linda tells Michael. Michael starts to retort that he takes this as a compliment; Linda interrupts him to emphasize that he should not. In a monologue that is a journal entry, Michael reveals that this banter took place the first time he ever met Linda, whom he describes as “achingly vibrant,” at a café in Paris. The encounter turns out to be a blueprint for their relationship, in which tenderness is masked, and undercut, by barbs. We soon discover that the marriage also has more than its share of secrets. Opening Michael’s journals, Linda reads his account of the time he spent at the Drake Writer’s Retreat in New England. Asked to suggest possible writers for the colony, Linda had submitted Michael’s name, to help establish his career. She quips that “Michael hadn’t published a word; yet they invited my husband.” She herself had spent time writing at the colony; it is where Linda penned the initial drafts of her novel, At the Cape. It seems inevitable that Michael and Abby will have an affair. What is more surprising, however, is the sequence of events that occurs during Linda’s own stay at the colony, which we discover when Michael reads Linda’s journals. Director Peter Bisgaier clearly demarcates the play’s present from the journal entries that provide flashback sequences. However, the blocking avoids becoming predictable, as the time periods share both ends of the stage. Dietz wants the audience off balance, and Bisgaier ensures that the production aids in that. If there is a minor flaw in the staging, it is that there are periods of time in which actors have their backs to the middle section of the audience for too long. However, Bisgaier elicits excellent performances from the cast, and the dynamics between all three characters are intriguing throughout the show. Jennifer Nasta Zefutie delivers a luminous portrayal of the vivacious Linda. Her impassioned line readings are matched by her confident use of body language. Subtle changes in facial expression, as Linda reacts to the entries she reads in Michael’s journal, are a crucial part of her performance. David C. Neal is entertaining as the glib Michael. He draws a successful balance between the character’s flippant cynicism and the tenderness that it hides. Sarah Stryker is suitably opaque as Abby. The full extent of her relationship with the other characters needs to be a mystery until late in the show, and Stryker is careful not to reveal too much about Abby’s emotions or motivations, until the appropriate moment. In tandem with Darren Sussman’s sound design, which evokes the flipping of pages, Katie Truk’s minimal but effective set aids Bisgaier in making the time periods distinct. At the foreground is a table and two chairs, to represent the café and the Waterman home. A desk is at the rear, where the scenes at the writers’ retreat take place. Robert Rutt’s lighting works with Chrissy Johnson’s costumes — which use a comparatively subdued palette that consists chiefly of gray, brown, and white — to create attractive stage pictures. In 2017 Pegasus presented Neil Simon’s Chapter Two, whose protagonist happens to be a widowed writer. Audiences who appreciate Simon’s work will enjoy Fiction, which is a veritable dictionary of wisecracks with an ache at its center. With a talented cast and creative team, this production by Pegasus makes the most of Dietz’s engaging script. 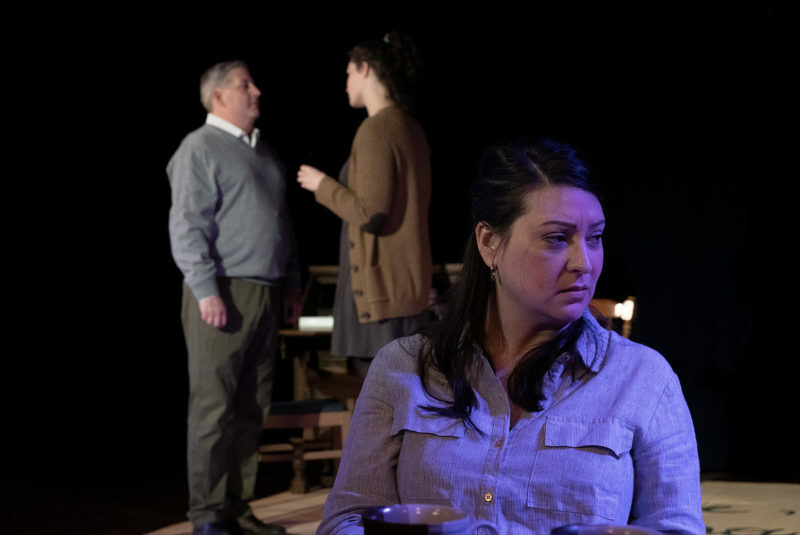 Presented by the Pegasus Theatre Company, Fiction will play at the West Windsor Arts Center, 952 Alexander Road in Princeton Junction, through April 14. For tickets, show times, and further information call (609) 759-0045 or visit pegasustheatrenj.org.